Let’s face it. Google gave up on Android as a tablet OS a long time ago. We heard rumours about a new OS called Andromeda that would run all tablets going forwards but at the last minute it was scrapped and much of the code was folded into ChromeOS. 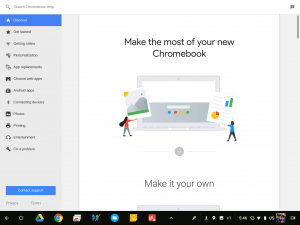 Now we are at a point where Google are starting to encourage the use of ChromeOS on tablets and it is not much of a stretch considering we have had convertible Chromebooks for a while that run Android apps. 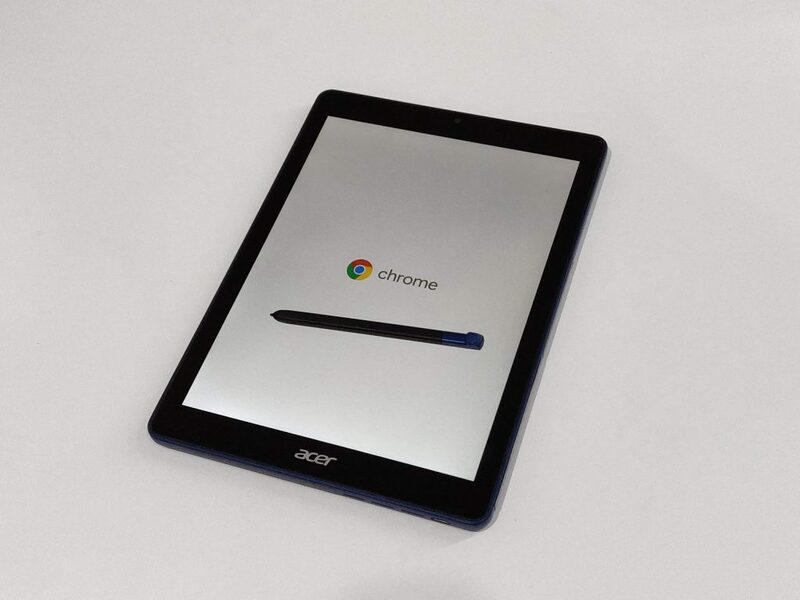 The Acer Chromebook Tab 10 is the first tablet running on ChromeOS to arrive on the market. Acer have made quite a few ventures into the Chromebook world so it was no surprise to see them be the first with a ChromeOS tablet. First made seem like a great achievement it is not always the best with many follow ups often bettering the first. Read on to see what I thought of the Acer Chromebook Tab 10 and whether Acer have a hit on their hands with this new form factor for ChromeOS. The Acer Chromebook Tab is a 9.7 inch tablet with a 1536 x 2048 pixel (4:3 aspect ratio) resolution. It is 238.3 x 172.2 x 9.9 mm and is Wi-Fi only, so no LTE options are on offer. There are stereo speakers along with a front (2MP) and rear camera (5MP). 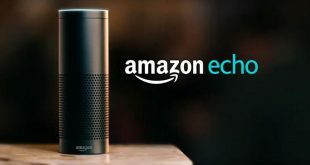 It is powered by a Rockchip RK3399 (hexacore) processor and 4GB of RAM with 32GB on internal storage (microSD support for cards up to 128GB). The combination of processor and RAM may make you think that it would not function well but it handled most of what I threw at it — I was able to play Riptide GP as well as I ever do (which isn’t saying much tbh) with very little lag at all (and it was great playing it on such a big display). Switching from one app to another was relatively quick as well, even from an Android app back to the Chrome browser. There were a few stutters by the tablet where it hung on what it was doing and never recovered, resulting in a reboot by the tablet (not initiated by me). The battery is a decent 4500mAh and is charged using the USB-C 3.1 charging port. The charger is more than a standard charger with an output of up to 45W max (20v x 2.25A) but still charges the tablet fairly slowly (see image below). A phone USB-C charger can be used to very slowly trickle charge it also. 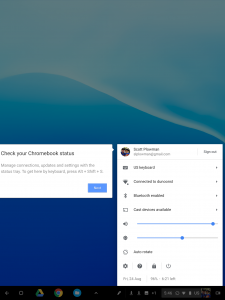 The Chromebook Tab 10 will run Android apps which is something Google have been working on for a while, most likely leading to this point of a tablet running ChromeOS. 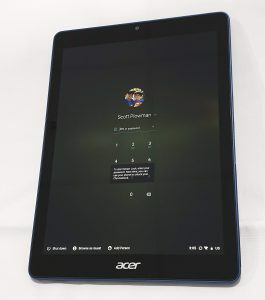 To help with the touch side of things Acer have included a stylus which slots into a silo at the bottom of the tablet and when removed opens some added stylus functions. We’ve been asking for Google to give us a tablet running ChromeOS for a long time, and now that it’s here I need to say, be careful what you wish for. It all sounds great in theory but it requires a lot of integration with the Android side of things. 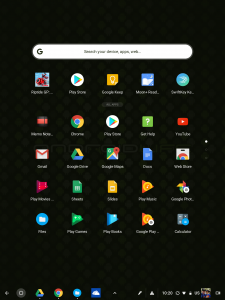 When using the tablet with Android apps I found that there were many Android apps that didn’t function as expected when running on ChromeOS. 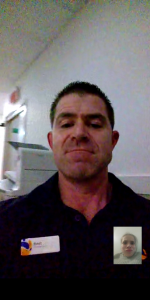 The main example for me was Moon Reader — the main use of a tablet for me is reading ebooks. Instead of the volume buttons turning pages they adjusted the volume. The Android app ecosystem just does not seem to gel fully with ChromeOS at this stage but in saying that there were some Android apps that made ChromeOS so much better — Photoshop being one. All the available games is another great advantage of Android apps on ChromeOS. 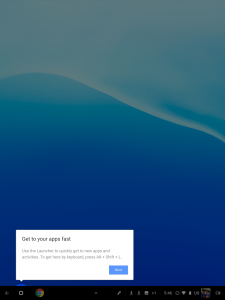 The problem with installing Android apps is that Chromebook manufacturers continue to shortchange consumers with a lack of onboard storage forever. 32GB will NOT hold many games ain 2018. You can use a microSD card but games never seem to run as well from portable storage. The speakers on the Chromebook Tab 10 were not great, they’re not front-facing and gave a very shallow sound. I felt that they could have done so much better with a device this large. 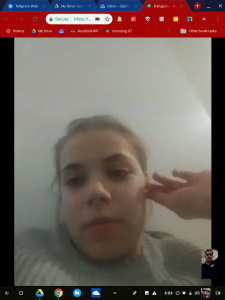 The cameras were average but a tablet camera should only be used for video calling — who doesn’t get a good laugh over seeing folks take pictures with massive tablets? They were good enough for their main purpose which is not really something you can and should complain about though and with an education and productivity focus, the tablet will capture notes from a blackboard or whiteboard with ease. Who is this Chromebook Tab 10 for? 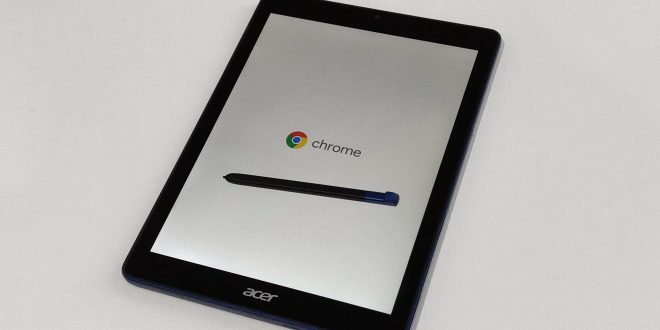 Acer are pitching the Chromebook Tab 10 towards education, schools but the problem is that while the Chromebook Tab 10 could be so very good for students it is unfortunately not. Without a hardware keyboard the Tab 10 is far less useful than it could be. There is a software, onscreen keyboard just as in Android but for anything more than typing a couple of lines it is a painful experience. There is not a lot of feedback while typing making it difficult to type. 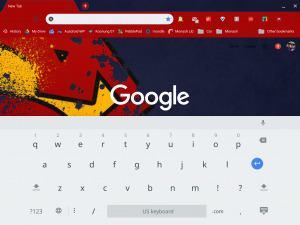 Installing third party keyboards with widescreen typing support from the Play Store seems like a great solution but ChromeOS does not let you change the keyboard to a third party keyboard just yet. Acer could have made this tablet so very much better by including, or offering, a folio keyboard as an accessory. An add-on such as the keyboard with the Surface Pro and Surface Go would have been perfect: something Google are rumoured to be doing for their new detachable Pixelbook variant due to launch next month. 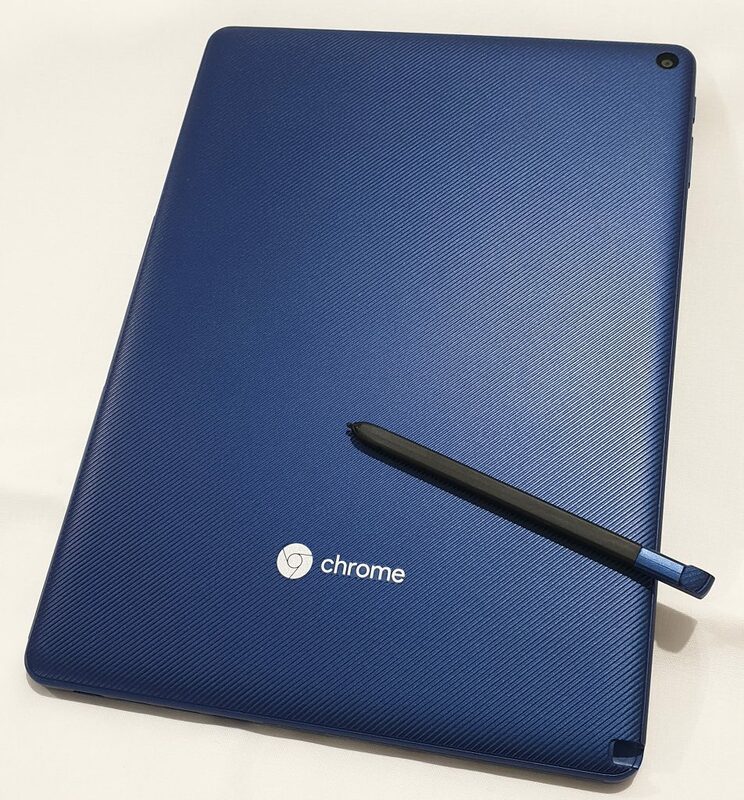 For myself, who is looking for a new tablet, a ChromeOS tablet is an idea that has merit, albeit with some issues. I was able to use it as a tablet for most things I required, reading ebooks, surfing the web, emails and social media but it would have been great to have the option to do more productive things without having to revert to a MacGyver-like PC setup. How are the Android apps on it? All apps I have tried work albeit not with all functionality. The integration of the volume buttons with apps is not the same as with an Android phone. I also had issues pausing media within apps using my headphones (ie. it didn’t work), a function that works perfectly with an Android phone/tablet. As for media apps they worked well and looked great. I was able to stream NFL games using the NFL app but they also have a decent website so you could also use Chrome browser to stream the games — this is the essence and the beauty of the Chromebook Tab 10. 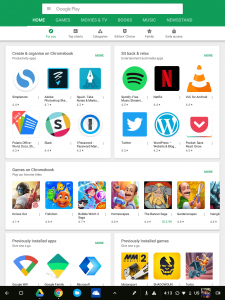 You can use either an Android app or you can use the full desktop style browser (assuming that app has that functionality) to achieve your goal. 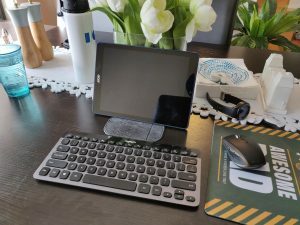 If you have a setup where you can lean the Tab 10 up against something then you can pair a Bluetooth keyboard and a Bluetooth mouse for a functional setup. The question here is why would you have that and not already have a full laptop setup as it is. I was able to pair the Tab 10 with my Logitech Bluetooth keyboard and Logitech mouse without an issue. Once paired, the Tab functioned as per a standard Chromebook which was great. Let’s face it, mobile websites are often less desirable than the desktop versions. For this reason browsing websites was a much more pleasant experience on the Chromebook Tab 10. The basic onscreen keyboard is definitely sufficient for use while browsing the web. The Chromebook Tab 10 is obviously smaller and lighter than all other Chromebooks which made it easy to carry about. The Chromebook Tab 10 offers advantages such as a much larger display than a phone for media consumption (you can install Android apps such as VLC to watch videos for extra options if you want) and the added functionality that the ChromeOS browser brings to the party gives it an advantage over tablets the same size. The battery life on the Chromebook Tab 10 is quoted as being up to 9 hours playing multimedia. Obviously if your usage is different to that such as mine is, then you will get a lot more out of it. I was very impressed with the battery life on the Tab 10. Although the battery is only 4500 mAh (some phones are over the 4000mAh mark) the charge lasted quite a few days with it on standby and never turned off. A pattern lockscreen: it is highly annoying to have to enter your password or 6 digit passcode every time you want to unlock the device (the keyboard often failed to enter it correctly). A fingerprint sensor or a lockscreen pattern would have been a great addition but it is possible that Google will be bringing that support in the coming months with it rumoured to arrive (along with NFC support for unlocking with their physical Titan security keys) with the next Pixelbook. I just made sure I left the Bluetooth on my phone on at all times and set the Chromebook Tab 10 to unlock when the Note9 was nearby which worked well. There was a few occasions where the Chromebook Tab 10 hung for a few minutes with the final result being a random reboot. There was no rhyme or reason as to what caused these hangs – Android apps? 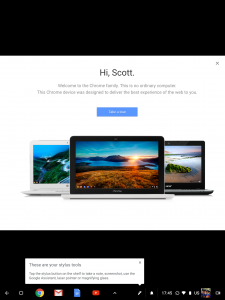 ChromeOS? It just happened randomly. It didn’t happen a lot, maybe three to four times over a few weeks – not heaps but enough to annoy me. As mentioned above it really needs a keyboard folio or case to make it live up to its potential. To use it efficiently I needed to lean it against a vase while sitting on a sticky mat. The Chromebook Tab 10 really needs more storage. Now that Chromebooks can run Android apps, 32GB just won’t cut it, hopefully manufacturers can begin coming to the party with this. Although the Tab 10 is a decent resolution the browser didn’t seem to scale as it should with many websites not entirely viewable. Easy fix of course, ctrl and “-” but surely this can be built into the system OS in future generations? Where to for ChromeOS on tablets now? 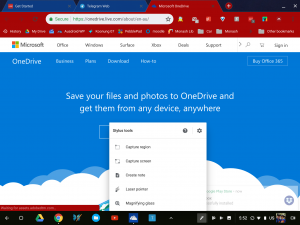 As a more general section having now used a tablet running ChromeOS I can see where they have done well and where needs work. The size is right. The tablet can be relatively small and very portable making it great for those on the move who only want to carry one device to do it all. Being the first Chromebook tablet you can sure we will see devices arrive either side of it spec-wise but this would be even better with a higher resolution display and a better processor. The better quality processor is just to help it run a bit smoother (after all we can run Android apps on it so it requires more processing power to run those games) without any hang-ups. At this stage, while ChromeOS is still not entirely touch friendly it requires a stylus and if you want to do any form of work on it, it will NEED to come with a keyboard as well — preferably a folio keyboard case. The Nexus 9 had a folio keyboard available to purchase and so should these. One of the benefits of having ChromeOS on a tablet is the ability to get some work done wherever you are but without a keyboard you may well struggle to do just that. Should you buy an Acer Chromebook Tab 10? The Acer Chromebook Tab 10 arrives sans keyboard unfortunately — add in a keyboard and it would be infinitely more useful. The display is a decent size and looks great while consuming media and although the speakers aren’t great the tablet can pair with your headphones for improved sound. The Chromebook Tab 10 is best suited to users who want a tablet that does basic things. Reading books was decent. 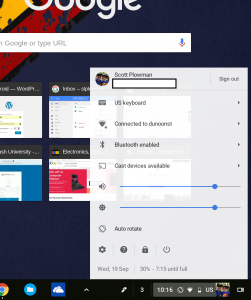 Surfing the web is much nicer on ChromeOS browser than any app on a phone. If you do not care for a multitude of typing or productivity then this could be the tablet for you. One thing for sure is that the future of ChromeOS on tablets is promising, especially with Google looking to release a Pixelbook of this ilk in the next few weeks. While the Chromebook Tab 10 is the first ChromeOS tablet it will most likely not be the last. I would also expect Acer to expand on what they have learnt in the development of this tablet with even better offerings in the not too distant future. 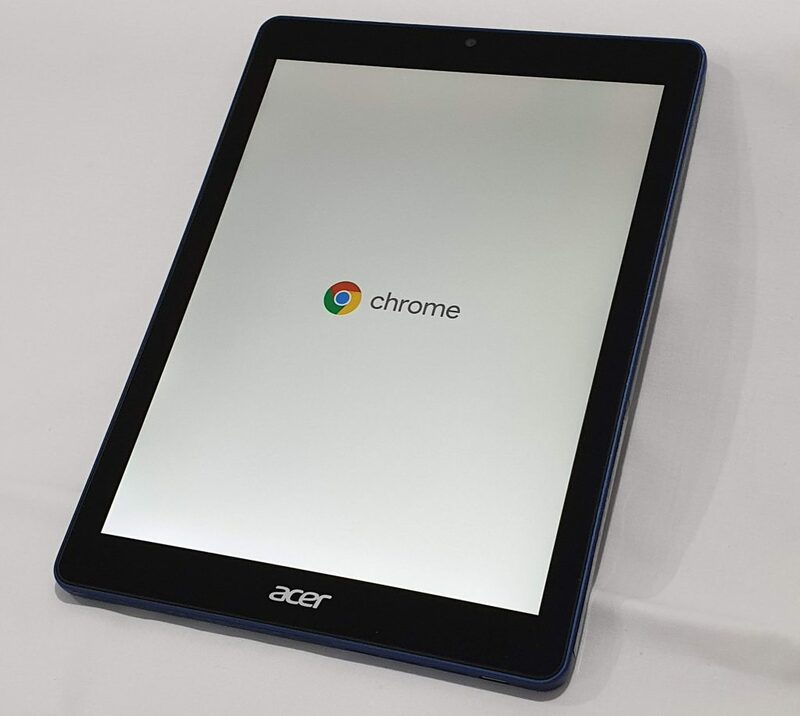 The Acer Chromebook Tab 10 is available in a blue colour from the Acer store for $589. I don’t know how people are getting the idea that it’s underpowered? The OP1 in the Samsung Chromebook Plus that I bought for my Mum was damn snappy until you started loading it up. It would certainly fare way better than an Android tablet or cheap Windows 2in1 under the same load. Any ideas if there’s an education discount on these? I was expecting a price tag of $200-$300 after reading the review and seeing the images of the tablet. I love Android but there isn’t a decent Android/Chome OS tablet I’d be willing to part money with at the moment. iPad and Surface is the way to go unfortunately. The Samsung Tab S4 LTE looks good but waaay overpriced, I’d definitely buy it over an even more overpriced & restrictive iPad though. The Samsung A tablet range is becoming a good option. I also find the Surface range either overpriced or underpowered depending on model although Microsoft appear to be one of the last decent manufacturers sticking with a genuine 2 piece 2in1 rather than the annoying 360/spin style. No Windows 10 2in1 should ever be offered with less than 8gb RAM and a good Core i5/i7. You know you can buy an iPad for $450 right? That’s half the price of a Samsung Tab S4 tablet. I agree with iOS being restrictive but at least you know it’s gonna get updates for a few years unlike Samsung tablets. I almost bought a Xiaomi mi pad 4 plus for $500 but it didn’t come pre installed with the Play Store and I’m not sure what Xiaomi updates are like. Um that’s my point, the 2018 iPad starts at around $450. Android tablets made by Samsung have become ridiculously expensive like iPads used to be. Not much else that i have seen ticks anywhere near enough boxes.